It would be nice to find a soft place to land and stay there for a while, but Trapper and I are on the move again! We moved into our little cottage just a year ago, but got the boot at the end of the lease. The owners, who live in the front house, claimed they planned to move into the cottage and rent out their house as a vacation rental. I didn't really buy it, and my suspicions were confirmed when I saw an ad on Craigslist advertising the cottage for availability on March 1. I won't get into the drama of what I went through initially when I moved in, but it must be time to move on. So, I'm sitting at my computer, with boxes and packing paper all over the place, trying to get this blog post published before I unplug the computer and move it over tomorrow in time to meet the Cable/Internet technician. I've already started moving boxes of kitchen and other fragile stuff over to the new place, and the movers will come in a few days for my furniture. Trapper won't have a big yard, but we will still be in Coronado and just steps from the bay and his favorite swimming beach near the Ferry Landing. We can walk the boardwalk around the bay, under the bridge, along the golf course, and into town. We have an awesome view of the San Diego skyline from our patio and I look forward to taking advantage of the many resort amenities in the complex - pool, gym, saunas, hot tub, weekly happy hour... I'm especially motivated to get settled quickly, in anticipation of Tennessee's arrival at the end of the month. I've missed participating in Bon Appetit's "Cook the Cover Challenge" the past few months, and February's "Modern Comfort" version of Chicken and Dumplings looked too good to pass up. I don't even recall if I've ever made Chicken and Dumplings, but I did enjoy this version with bacon, white wine, and assorted mushrooms. It was even better the next day for leftovers. 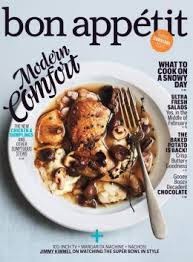 You can find Bon Appetit's cover recipe for Chicken and Dumplings with Mushrooms in the February issue and here. The only change I made in the original recipe was searing the chicken to a rich golden brown on both sides. Next time, I will also reserve the crisped bacon and sprinkle it over the finished dish at the time of serving, rather than adding it to the pot to simmer for 2 hours with the chicken. If you don't want to make the dumplings, this would be fabulous served over mashed potatoes, or even rice. For my "cover" photo, I added a glass of wine. 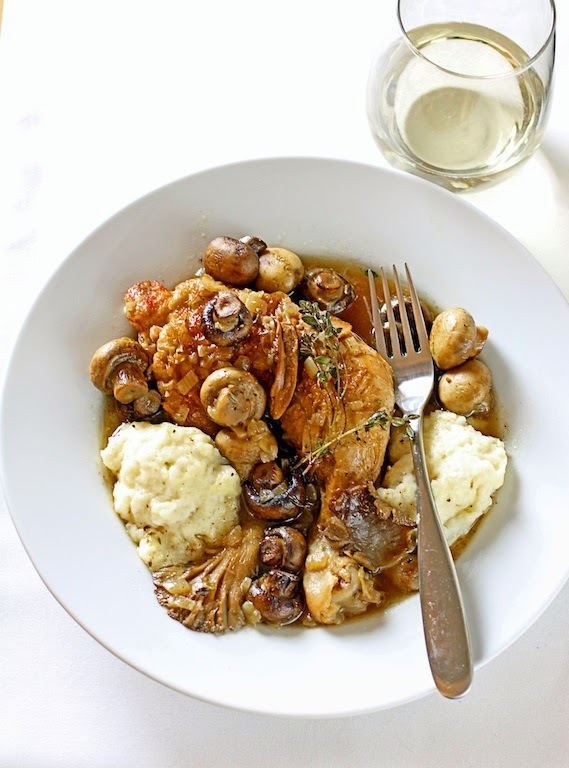 I used a nice Sauvignon Blanc in the recipe and managed to polish off the rest of the bottle that evening! C & D look scrumptious! Too bad the digs didn't work out - but I'm sure that you and Trapper will be just fine in the condo. Jim and I have often thought about moving over there.